So which is the right render? The one directly above looks like two buildings joined by a skybridge. 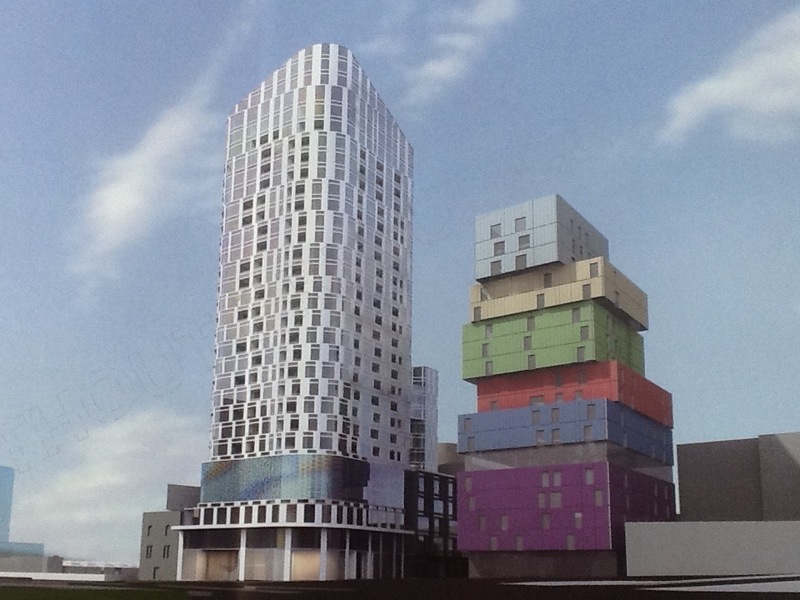 The other renders depict one large sloping mass of a builidng. probably a better outcome, less bulk and the residents at the rear of Icon still might have some hope of retaining at least a small bit of their city views. Pitty...because I preferred the first design with sloping floors...it was more fluid and prominent on the skyline and better integrated overall...ahh well residents from neighboring building will get some views; I assume that was a condition of approval....just hope it does not create more wind with this new design! MUCH prefer the two tower format. Worried though that theres little setback, that on the wellington street side the most necessary. I suppose just because otehrwise it makes that spot suddenly feel very crowded. Like the wrap around digital ad screen - but theres already a big one on the chinese restaurant on the corner .... and whats to stop another skinny tower going on that site ? This is an example where the CBD guidelines (in progress) regarding setbacks, tower separation, outlook etc applying beyond the CBD would be useful. I too much prefer this design, but not keen about the digital sign. I think the two tower separation is a better design outcome and I am not overly concerned about the lack of setback when you consider how wide the highway is to the north. Mind you, building over the highway should be something the state government should put out to developers to do. I think the small building on the corner is part of this development, and anyway, it is covered by a HO, which is very surprising to me. There will always be an advertising sign at that location, sadly. And here comes The Aged with their usual rampage... OH THE HORROR!!!!!! Victoria's planning tribunal should be "reined in" or stripped of its powers after it approved another huge tower complex for the St Kilda Junction, says a Port Phillip councillor. At 26 storeys, the twin apartment development One St Kilda Junction will be the largest yet for St Kilda's gateway road intersection. Two towers are set to constructed at the messy meeting point of St Kilda Road, Punt Road and Wellington Street (one 43 metres high, the other about 96 metres high). The buildings will be joined by a sky bridge. Port Phillip Council is seeking legal advice over whether to appeal the decision at the Supreme Court. The council's preferred height limit for the area is just 10 storeys, more than two times shorter than the tallest approved high-rise. "I think it is a disastrous outcome for the area," said Port Phillip councillor Andrew Bond. "It's become obvious there is a real disconnect between Victorian Civil and Administrative Tribunal (VCAT) and the community. It's time for the minister to rein in VCAT or remove them from the planning process altogether." As part of the permit, developers Drekoncile received the green light to build a huge electronic advertising sign, two-storeys high, which will wrap around the building's western facade. The planning tribunal found that signage was part of the culture of the St Kilda Junction. "The junction has been changing over time and there are more people living within, or in close proximity to, the junction and as such, are constantly exposed to the lights of advertising." St Kilda Junction Area Action Group representative Kaye O'Connor said the sign was "ginormous" and while "some people may think that's appropriate for St Kilda Junction, the residents don't". Controversially, the tribunal also decided to give no weight to an attempt by Port Phillip council to introduce new height restrictions in the area. Senior member Jeanette Rickards and Senior Member Peter Gray pointed to a flurry of high-rises already approved in the area, including another 26-storey building STK at 3 St Kilda Road and the 18-storey Icon building, nicknamed the Lego tower. Port Phillip mayor Bernadene Voss said she had sent a number of letters to Planning Minister Richard Wynne asking him to introduce interim planning restrictions for the junction and a southern stretch of St Kilda Road, to no avail. As a result, there is concern from the local community that the precinct is vulnerable to further "inappropriate" development. One St Kilda Junction will have 203 apartments and 397 car spaces. Originally the site was to have just one building, but it was split into two to allow more sunlight to Wellington Street and neighbouring developments. The towers have been designed by Plus Architecture and one of the firm's directors, Ian Briggs, said he hoped the project would spur major improvement of the junction. "It's such an important junction for pedestrians as well as cyclists and motorists and yet it's a bit of wasteland at the moment," he said. "I think with the increase of people and its usage there will be more pressure on council and governing authorities to do a whole lot more research and work to make it a much better place for everyone." yes build over the road ! and sadly an HO wouldnt stop a facade job and something bigger, or in this case even a challenge to demolish entirely. I should add that theres been quite a few attempts at planning for a better junction but they all seem to have come to naught, and now sites are being developed without a coherent plan at all.....though maybe its OK if it just becomes / stays a mess ! its council's fault for not doing strategic planning. on the flip side it makes perfect sense to put this tower here. I have no idea they need 397 car spaces fro 203 apartments. how many trams run in this area + walking distance to Windsor Station + Punt Road buses + good cycling clinks. Shame about it blocking the view of the Lego buidling though coming from the north along Punt. I agree that I wish it didn't need that many carparks...but surely you know the reason why they'll have so many. With off street parking such a luxury (especially in this area) I'd imagine offering apartments with carparks is a real selling sweetener. I don't care what anyone says....but that northern western side of Fitzroy Street should also be littered with 20+ storey buildings. Blasphemy will get you straight to hell in this case! I also happen to think the same; the whole intersection should be redesigned with dutch style bike and footpath flyovers and garden podiums! Which part of the street are you referring to exactly, Michael? "northern western" suggests the parkland towards Punt Rd, no? Or are you just referring to the north side of Fitzroy Street more generally? 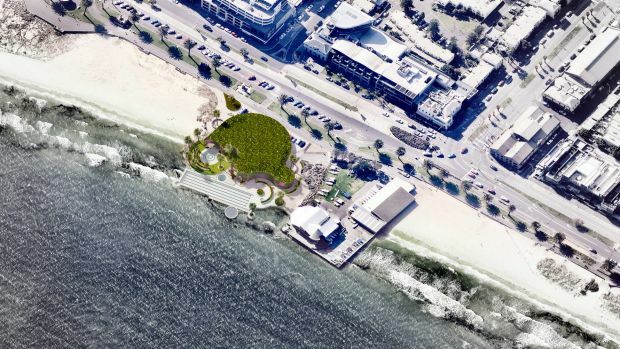 More than a decade ago, when his local council asked residents to come up with ideas for the foreshore along his part of the bay, Port Melbourne resident Rohan Cresp dreamed up the idea of a sea pool. "The only thing that came out of the process was a proposal for a pool in St Kilda," says Mr Cresp. That St Kilda ocean was never built, but now Mr Cresp is trying a different way of floating his idea for a bay swimming hole, that he believes could be constructed on what now serves as the parking lot for Port Melbourne Yacht Club. "This site is the gateway to Melbourne", says Mr Cresp, for people arriving by cruise ship and the Spirit of Tasmania. The site is also within walking distance of local schools. "Brighton Baths is the closest thing to this [idea]," says Mr Cresp, who is understood to be now sizing up a tilt at election in October to the council that once shunned his idea, Port Phillip. To prove his seriousness about the pool plan, he commissioned WOWOWA Architecture & Interiors to create renders of what it would look like. Whatever happened to the proposal for St Kilda pier with the pool and decking......pretty sure that was all good to go at one stage.